4 days before coming to Yunan, I bought a RM5 Peach in Guizhou as i was craving for it. However, days after days~ I did not want to eat it cause it felt hard and I thought it would be not riped. In our journey to Yunan, the bf told me that he forsees that one day, I'm gonna open that bag and thought of eating the peach and then realized it's gone bad. And his predictions came true while we were on our way to SHANGRI-LA ! SO he said : See La !! and LOL at me. Well, we heard the road to Shangri-la from Lijiang would take 6 hours but thanks to the government, the road improved ! It only took us about 4 hours plus but could have been faster if the yaks on the way were much kind and thoughtful. The journey from Lijiang to Shangri-la was INTERESTING !!! It wasn't what we expected compared to Lijiang as it suddenly became to rural and there is a sudden difference in the house architectures. Moreover, the view is just amazing ! One thing in the journey is that we will be going a lot of uphills and downhills and then at some point, it's just a straight flat road all the way ! Well, then you know this long straight road means you are near to Shangri-la itself ! The first thing that caught our attention as we arrived was this cute vehicles. People in Shangri-la look a bit different as well. We then took a bus to the old town of Shangri-la which was burnt just a year ago but then able to find a decent Moon Guest house with a traditional Tibetan bed and the view of the golden temple for only 80 yuan. Apparently we are here at a low season and due to the fire, not many would prefer to stay there anymore. We had a very nice owner and they were telling us the story of how the fire spread and yet they were lucky as it stopped just a few shops before theirs. Then it was time to walk around this area ! Despite of the construction going on, we thought it was still nice as there are still some shops around and most of the the temples are not gone. Anyhow, it was a little bit dusty but the weather was just amazing. Many still come as day trips to visit this golden temple though. Just to push this big golden prayer wheel and believe me, it takes min 10 person to pull it and yet it is still super heavy ! But well, if many people constantly pull it then its easier. From the temple itself there is a view of the old town which wasn't burnt yet. And we then took a long walk up the hill to find the 100 Chicken temple. On the way up, there were signs of those whom steals chicken would get bad luck or bad karma. and on top here, plentiful of colorful prayer flags. 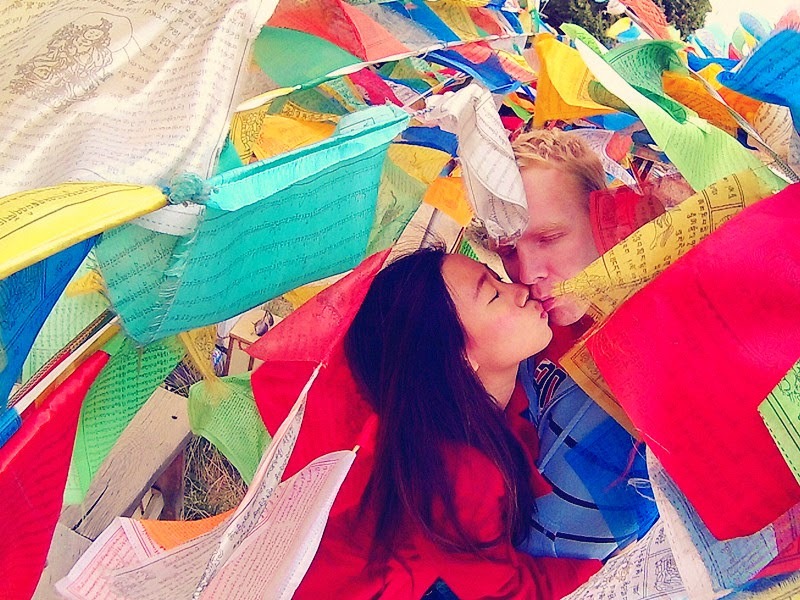 And this is how the inside of the prayer flags tent looks like ! So, I didnt went into the 100 chicken temples. I was just chilling and enjoying the sunset from this hill. But then it got super windy and cold and i had to use an umbrella to be my wind breaker. and the Night view of the Golden temple was just gorgeous ! Everything was dark except this temple. And you will see the locals dancing on the square right in front of the golden temple ! Their dance steps are more traditional and interesting ! We joined in as well and it was fun ! 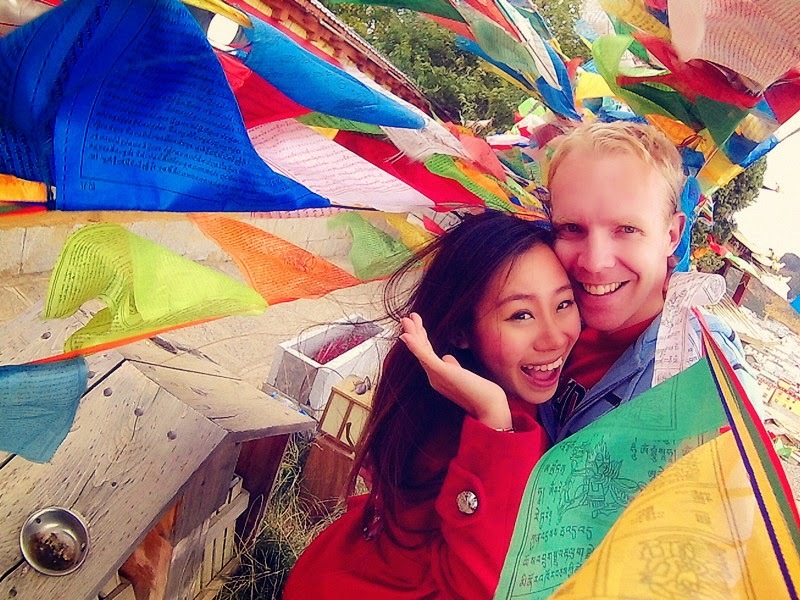 In the end of this video would be a clip of us running through the prayer flags in Shangri-la. Honestly, there are much more to be done in Shangri-la itself but due to our hectic plans, we had to leave next day to Deqen. We would love to come there again and explore more of it.